To mark the successful opening of the opera house we express our gratitude to Michael Hammers and to his team for their extraordinary commitment to the Berlin State Opera project. Without their involvement the project would not have reached the conclusion of the opening on 3 October 2017. Michael Hammers is a man possessed; he puts art into architecture. There is something truly ingenious about his artistic spontaneity, sensitivity and technical inventiveness, and it is this combination of qualities that creates unique works for clients all over the world. Michael´s professional root is to be one of the supreme and true masters of blacksmithing. Because he has such comprehensive specialist knowledge in the metal restoration sector he has the reputation of being skilled advisor to architects, to keepers of historic monuments and to curators and for performing fabrication work for them. Under the roof of Michael Hammers Studios in 2010 he founded SCHMIEDE AACHEN – in English Aachen Forge – continuing the tradition of metalworking centres in Aachen that goes back more than twelve centuries, back to the time when Charlemagne gave the order for the construction of his Palatine Chapel. 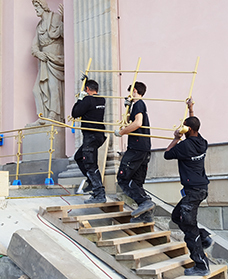 Late in 2015 the accolade of being chosen as contractors for the restoration of all historic interior and exterior ornamental metal fittings at the Berlin State Opera was given to Michael and his team. Lead by Michael the team restored historic metal artefacts, preserved old metalwork, redesigned and fabricated things new: 15,000 hours of work, 15,000 hours of utter enthusiasm and devotion to executing the task which they had been honoured to be given at this wonderful building and one with so many historic connections. Michael Hammers not only teaches the workshop’s apprentices, but also holds seminars for students of design and architecture from European universities. He is Schmiede Aachen’s mentor and master, a mage of iron and fire: ‘It is only through the skilled use of craftsmen’s tools that culture is created’.